As you know, the One Laptop per Child project is something that’s near and dear to my heart. I love how they’re making technology and thus the world accessible to young people all around the globe. Well, they just announced the 3rd generation version of their XO computer which will be a tablet for around $100. I’m excited to track their progress. Today is the last day of the Give One Get One program from One Laptop per Child (OLPC). If you want to buy one of their XO ($100) laptops, buy today and support this AWESOME program. Found this really awesome video that describes the mission of One Laptop per Child (OLPC). OLPC is SUCH a cool program. Give them money or buy laptops for your kids and kids around the world. If you have been reading this blog for a while, you know how passionate I am about the One Laptop per Child (OLPC) program. The notion of giving kids access to the tools and information they need to learn and create is so exciting. OLPC does this through their inexpensive XO laptop. 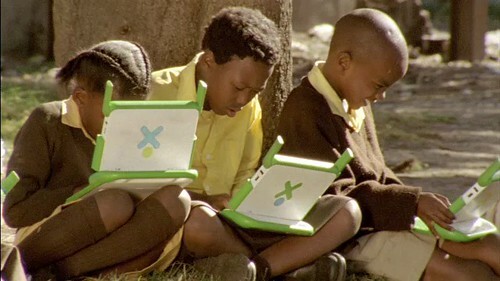 Check out this AWESOME commerical they just launched for OLPC. It tells the story of a OLPC user Zimi. SO cool. Well, once again, you have the opportunity to give a child in another part of the world a laptop and change the world by unlocking the world for them. OLPC has re-launched their Give One Get One program. This time they’re doing it through Amazon.com You can just make a donation of a laptop for $199 or donate one and get one for yourself for $399. So, what are you waiting for? Make a donation NOW! Update: Here’s the video of Zimi from YouTube. I love the One Laptop per Child project so much. Being able to expand the horizons of young minds… showing them the world through the Web is so frickin’ cool. One thing that I miss from my old job is that I’m not involved with helping the project any more. So… I’ve been following the project closely online. There is a cool blog post talking about how they’re doing their second deployment in Ethiopia . Plus they have tons of amazing photos. If you’re a long time reader of this blog, you know that I’m a HUGE supporter of what the folks at One Laptop per Child are doing. Previously they had done a program where you could get a XO laptop and give one to a child in the developing world for $400. Well, OLPC is restarting the Give 1 Get 1 program on November 17th through Amazon.com. Last week a One Laptop Per Child official leaked that Amazon.com will be taking the orders for the company’s upcoming Give 1 Get 1 program. 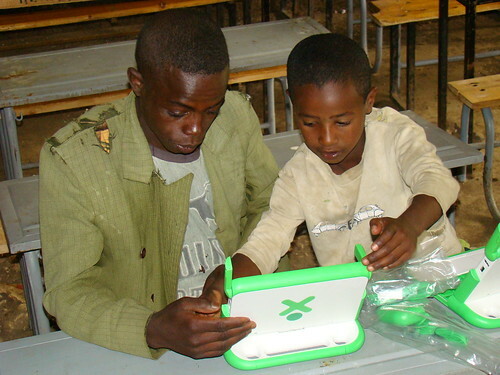 Through OLPC’s second annual Give 1, Get 1 program the XO laptop will be made available to U.S. and Canadian consumers, but only if they buy one to donate to a developing nation. OLPC Founder Nicholas Negroponte confirmed that Amazon.com will offer the XO laptop starting on the Give 1, Get 1 launch on November 17. According to Negroponte the laptops will retail for $399. I’m excited because tonight is the January meetup of the Washington DC One Laptop per Child (OLPC) Learning Club meetup. As you all know, OLPC is an initiative that I’m very passionate/excited about. If you’re a OLPC fanboy like me or interested in learning more about the initiative, this is a great opportunity to come, meet like minded people, and get your questions answered. I’m going to be giving a short talk (15 minutes) about some of the content initiatives that I’ve been apart of with OLPC. Should be fun! The event is at Greater DC Cares at Greater DC Cares 1725 I (Eye) Street, NW, Street Level Entrance, SunTrust Conference Room, Washington, DC 20006.